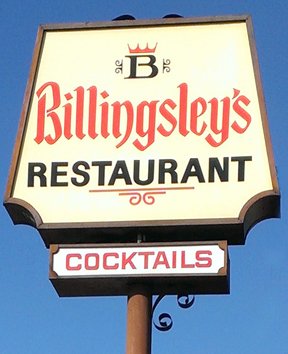 (1946) Billingsley’s, West L.A. | Remains of L.A.
Sunday dinner with David (my husband) and my in-laws, Jim and Keren, at Billingsley’s in West L.A.
Billingsley’s was started by the husband of Barbara Billingsley, the mom in “Leave it to Beaver,” and the restaurant is now owned and operated by her sons. 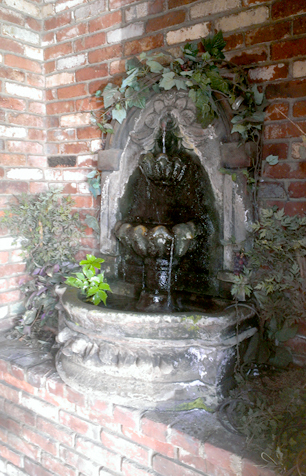 -Just inside the brick entrance is a beautiful stone fountain. On the wall leading inside are wooden prints, pictures of spices and handwritten instructions on how to use them; they look like they came straight out of an early ’70s suburban kitchen. The restaurant is dark, wooden paneling on the walls and heavy wooden booths with posts that reach to the ceiling and dark red leather seats. The bar is lined with red lights, and a large aquarium keeps it from being gloomy. Two more aquariums are in the center of the dining area. On the walls are old advertisements for things like Borax and “Thelma: the Queen of Perfumes.” Also framed front pages: “Man Walks on the Moon,” “London Bombed” and the like. There are small lit tiles in the ceiling, here and there, with flowers on them. It is cozy and close and feels warm and safe. -The menu was large and varied, and everything looked great. Jim and I in particular had a very hard time deciding what to order; the waitress had to keep coming back. I finally settled on the steak from the “lite” menu, choosing rice pilaf for my one side (that’s what made it lite). When it came, it turned out to also have mixed veggies with it, but they were sort of tasteless. The best part was the truly sensational garlic toast. Also we shared onion rings, and I got the last one, since mine was the only meal that didn’t come with salad. 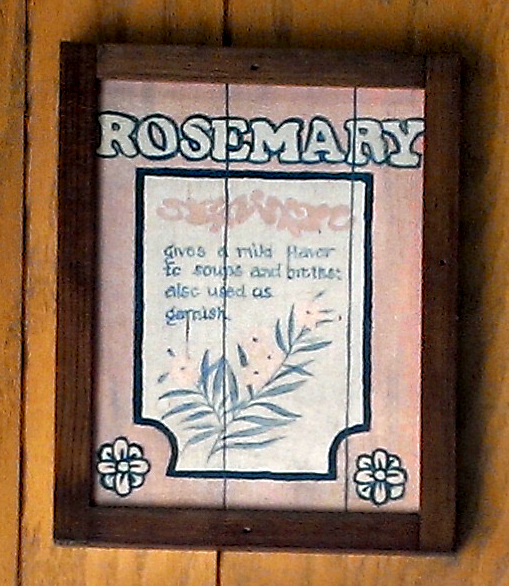 -In each booth was a pretty little flowered tile with a number on it. Every booth but ours. Looking at the other numbers, we were pretty sure it was because ours was number 13. -There was a ceiling fan directly above our heads, and every now and then I’d look up and think how glad I was that it wasn’t turned on. That would have been awful. -In the menu they spell barbecue “Bar BQ.” I aways find it interesting what different restaurants choose to do with that word. -Somehow I expected a lot more pictures of Barbara Billingsley. I only found one, near the cash register; a shot of the whole Leave it to Beaver cast. She was the only one who’d signed it. -Near the restrooms was a shelf that probably once held a phone. On the shelf sat an extremely battered paperback copy of Great Expectations. I like to think it was there for anyone who came to eat alone and forgot to bring a book. -I was a bit disappointed with the ladies’ room, which was completely undecorated. White walls, faded pink tile. A framed rectangle of ads, calling itself an “indoor billboard,” telling me about things like movietickets.com and hair restoration systems. There was a sign on the door pleading with me to lock behind me, and another on the wall by the sink saying the same thing. This is where those prints of spices would have looked really nice. -When I took the wrapper off my straw, I found that one end was sealed shut. A mess-up at the factory, I guess. I’ve never seen that before. It was okay, I squeezed the end and it opened right up and worked like a normal straw. -There was some kind of large banquet room in the back. A big party of people came in together, and stood in the lobby for a while being loud and gregarious. They might have all been related, but seemed to maybe also be related to the waitress and perhaps the bus boy. They went into the banquet room and it was much quieter after that. -Our bus boy was fantastic; I have seldom seen anyone refill drinks so quickly or enthusiastically. When we asked if we could have more garlic toast he made us feel great about it. -Keren and David (my husband) both got early bird specials, which came with dessert. Keren guessed this was the sort of place that carried tapioca pudding and she was right, but they also had rocky road ice cream so she got that and David (my husband) got spumoni and Jim and I helped them eat it. -There was an old mirror ad (the kind of ad that’s painted on a mirror) for Colt and I’d just assumed that it was for Colt 45 Malt Liquor but no, Jim pointed out it was actually an ad for a gun. -I asked Keren and Jim why so many of these old signs make a point of saying that they have cocktails and was told that at one point fancy cocktails were incredibly popular–like, you’d never just order wine or beer–but a lot of places didn’t serve them; there was still a bit of prohibitionist aftertaste around. So the places that did made sure to say so, and people would discuss where they should go for cocktails and would want a place that specialized. So, “cocktails” signs. I guess it’s like nowadays when places make such a big deal about their beer. What I Ate: Onion rings, garlic toast, steak, rice pilaf, two bites of bland veggies, some of Jim’s bar bq pork rib, a bite of rocky road ice cream, a bite of spumoni ice cream. What Sort of Ghost I’d Expect to Find if I Believed in Ghosts Which I do Not: Two women in pastel pantsuits and scarves in their hair; they’d come to the bar for a drink once a week while their husbands stayed home with the children. They’d also sometimes come to the restaurant for dinner with their families, and the bartender would helpfully pretend not to recognize them. 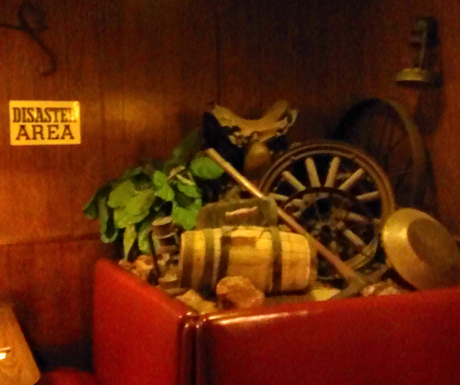 Categories: Restaurants | Tags: 1946, Los Angeles, Restaurants, retro, steakhouse, vintage | Permalink.